If you’ve been reading this blog for any length of time now, you can guess that when there’s radio silence, someone’s sick. And when you’re a family of 4, the sickness often goes through the entire family before another illness hits. We were buried in a sea of medicine, tissues, vapor rub, sippy cups and lots and lots of coffee for basically the entire month of May. Sick twins is no joke. Life literally stops for a while. We are finally on the mend and pretty much sleeping again (hallelujah)! 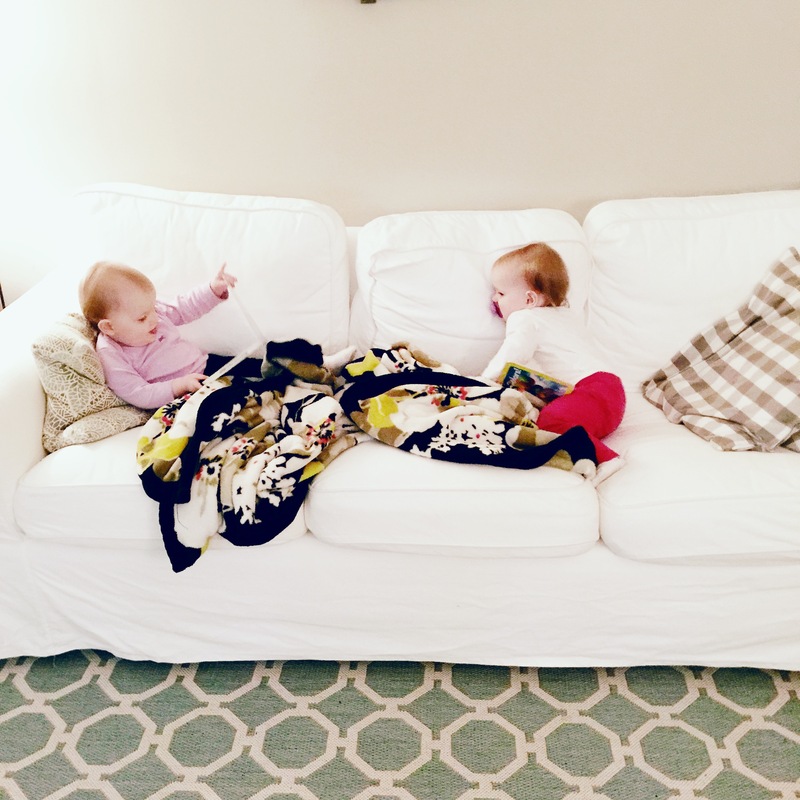 Now that the girls are feeling better, they have decided they only need one nap a day now, which is normal for their age, but I now have to figure out how to entertain them for the 11 hours out of the day that they’re awake. E L E V E N. I love those sweet girls to death, but their attention span at this age is so short and I run out of ideas quickly. And now that they’re running around everywhere, our house gets smaller and smaller by the minute. I have to admit, I get super envious when I hear someone say the word playroom. I mean, it’s a room completely dedicated to PLAYING!? (If you told me 10 years ago that those words would come out of my mouth I’d laugh at you). In a 790 square foot house, all of our rooms are multipurpose; actually, almost everything we own is multipurpose. Aside from our bedroom and bathroom, which we close off when the girls are awake, the entire house is the girls playroom. How do we do this without allowing our house turn into a walking hazard of toys everywhere? 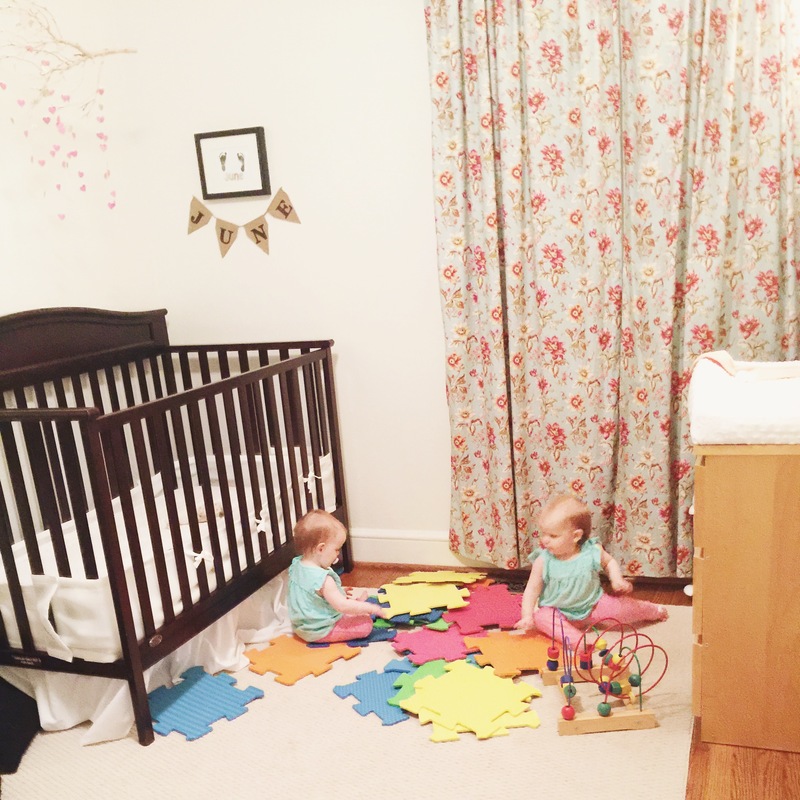 Here are some tips if you also don’t have a dedicated play room or if your house is on the smaller side like ours. Storage. This is pretty obvious, if you don’t have anywhere to put said toys, they will just go everywhere. Spread it out. Our main area that we play in is the living room so most of their toys and books are in there, but we also have toys and books in the nursery. This also helps with having a change of scenery or when I need to separate the girls. We may need to change this once the girls aren’t sleeping in cribs anymore but for now this works. We also use our back yard all the time now that it’s nice out. They have room to roam and explore when I’ve had enough of them exploring every outlet and cord in the house. Also…play dates, parks, museums, libraries, etc. Keeping them busy is the name of the game. Clean up throughout the day. I typically don’t clean as the girls are playing because if I put something away, that is in fact the exact toy that they both will want to play with. I do put things away once they go down for their nap (and bedtime), otherwise the toys just get overwhelming and by the end of the day there’s nowhere to walk. And for toddlers who aren’t the steadiest walkers, this is extra important. Get rid of stuff. We donate or sell toys or items quickly after they no longer use them, especially things that take up a lot of space. 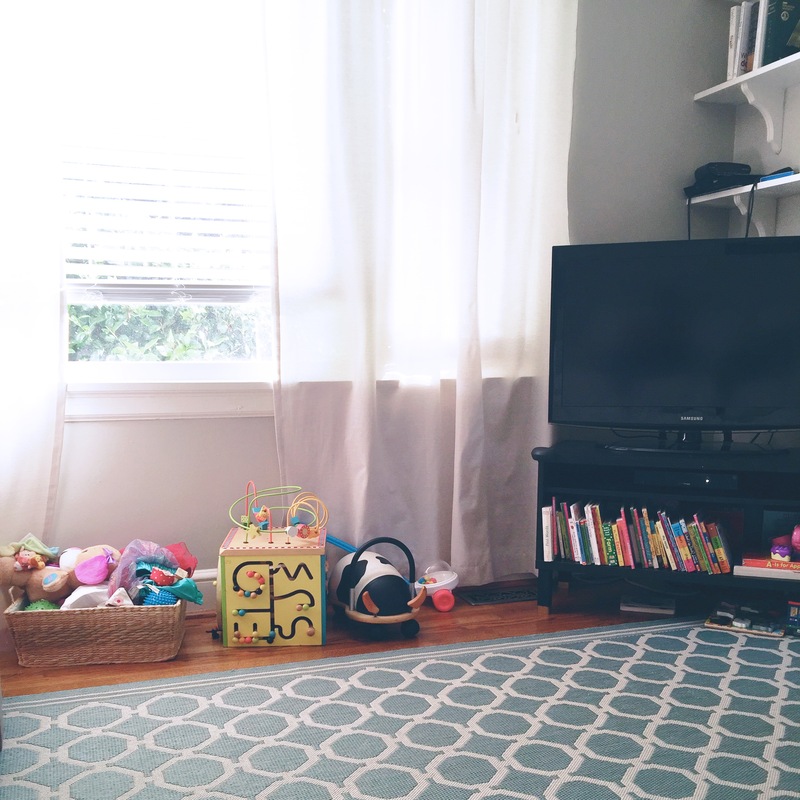 Designate a toy free room. For a while, I was nursing the girls in our bedroom so that also became their space, but now we’ve taken it back. The girls LOVE coming into our bedroom but we don’t have any toys in there. 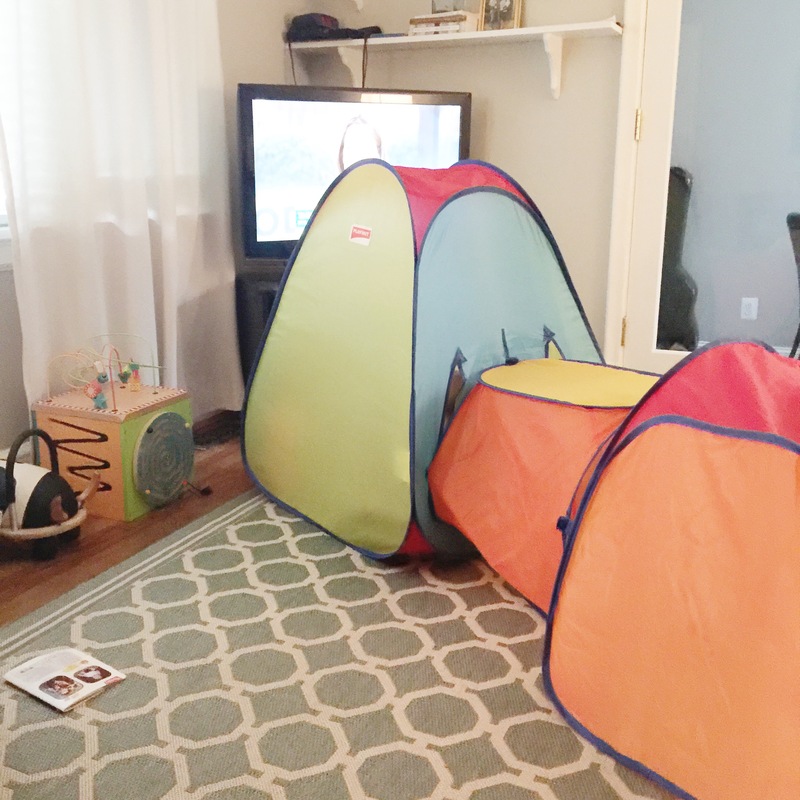 It’s our space, the one room I don’t have to childproof. Let your home just be. This is hard as a decorator. I love having a pretty space but currently most of our rooms have completely cleared off surfaces, and our living room is down to one lamp. This is their home too and saying “no” all day long isn’t fun for anyone. It won’t be forever so I’m going to enjoy each stage, even if it’s the childproof home/toys everywhere stage. We do not have a dining room in our house, (if we did it would look something like this) but we still have to eat. Since the girls were born, most nights you can find C and I on the couch having dinner after the girls are in bed. Until recently. Spring forward has adjusted our schedule a little so the girls have been up a little later than usual, so we’ve been making a point to all have dinner together. 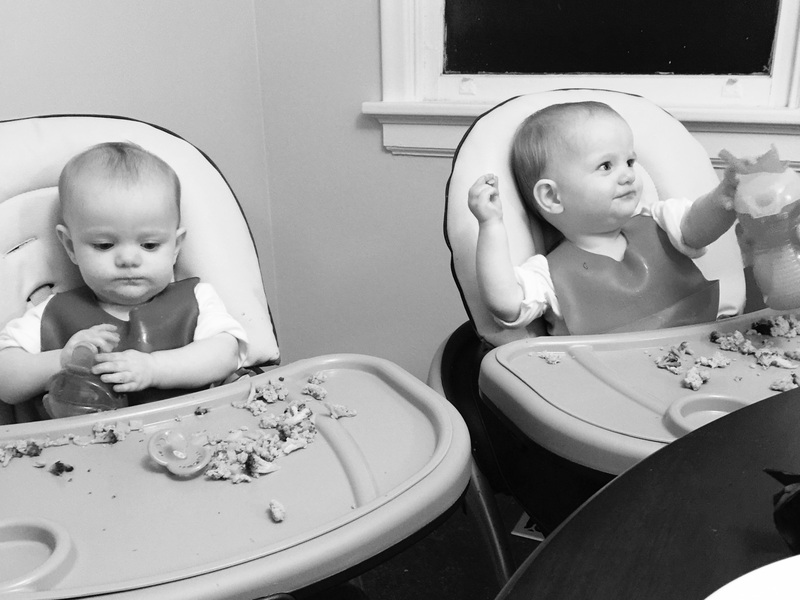 Growing up, we always ate dinner together, and I think it’s super important. Reading this further motivates me to sit down as a family for at least one meal a day. It’s not easy, it takes a lot of planning and the girls are not happy about me leaving them for even one second lately, so preparing dinner while they’re awake makes things challenging. But it’s worth it for us all to be together at the end of the day, even if it only lasts 10 minutes. This brings me back to our kitchen set up. Since we don’t have a dedicated dining space, we’ve had to create one in our kitchen. We thankfully have the space, just not a lot of it, so we’ve had to get creative. 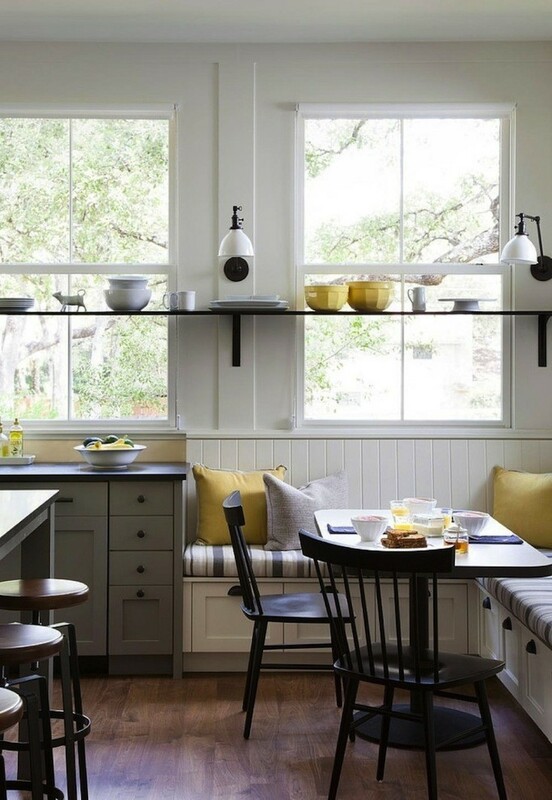 I’m in love with the idea of bench seating in our kitchen, and have been long before kiddos. 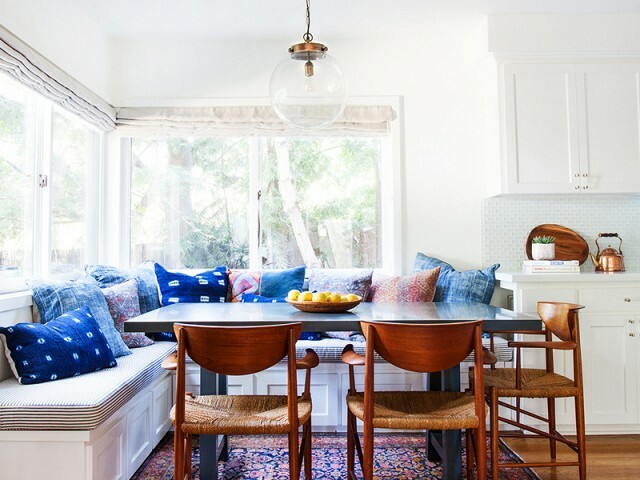 It makes use of a small space so much more than a bunch of chairs. Here are a few ideas I’m thinking of. 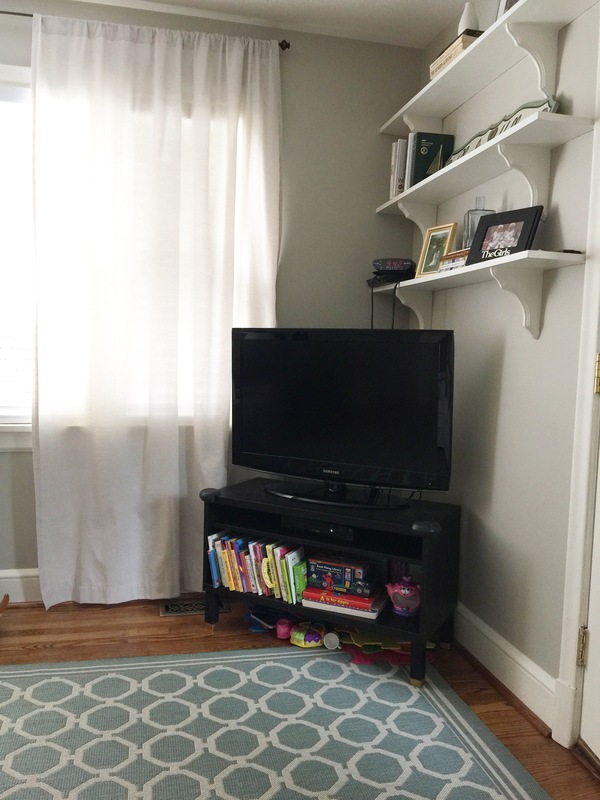 Almost everyone has a TV in their home and decorating around it is usually a challenge. I’m past the point of decorating around it and have just embraced the fact that we watch TV and it will be in our home. Period. 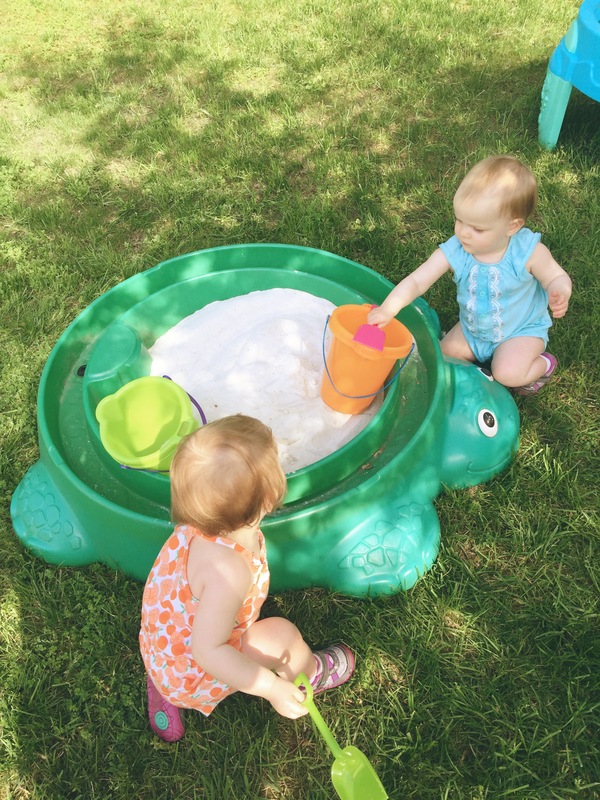 But here’s my issue…. Never mind the abundance of toys and books, that’s just the current state of our house. We have kids therefore we have toys. My issue is safety. You may remember I did a quick makeover of this cheap Ikea media stand to make it taller and that’s worked great. But my kids are also getting taller. I’m constantly pulling my girls off the stand and have been since they first learned to pull up on it. Little Miss June has recently found the buttons and cords and it’s now her new favorite way to get my attention. She reaches for it and smiles at me, she knows what she’s doing. The TV is anchored to the stand, but I’ve got to do something before they’re tall enough to knock the whole thing over. As you can see, we don’t have much room for a taller or bigger stand, nor do we have many options for room arrangements if we put the TV in another location. I’m just stuck and open for suggestions!